This is a gridwall acrylic brochure holder featuring three separate pockets. 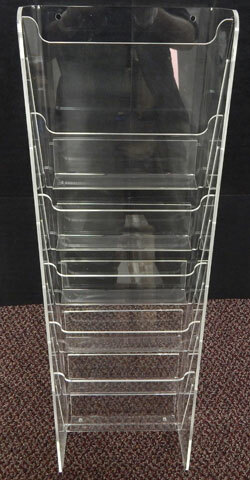 The clear design of this brochure holder is optimal for allowing your customers to view the items on display. The simple design also does a great job of blending into a retail space's design aesthetic seamlessly.The gridwall brackets provide an easy installation. The acrylic materials that we use in the construction of our brochure holders is of the highest quality to ensure durability. This acrylic brochure holder is constructed for gridwall use only. It features 2 pockets that each hold 4" x 9" brochures. Clear acrylic constructions make viewing brochures easy. Request a freight quote today! Save valuable counter space by displaying your brochures on your gridwall system. Available for two brochure sizes. Choose from the size options below.